Discussion in 'Single Player Forum' started by NagisaFurukawa, Jul 2, 2010. Poison Explosion: wonderful in theory, terrible in practice. Despite its ridiculous damage figures, Poison Explosion is vastly outperformed by its brother in crime. One of the major reasons for this? The terrible radius. Result: Little chambers separating monsters by a hair over the radius of PE is just what I wanted. ...wait. Short and sweet this time around, no thanks to the forum downtime just now killing my first attempt at posting. Not a very complicated build, nor one I could easily recommend for anything other than a good time, assuming you consider this kind of build "fun". :crazyeyes: His only notable finds were a Captain's GC of Sustenance, Laying of Hands, and a Mal rune from the forge. No real plans for this guy in the future, unfortunately. I don't like to respec these kinds of characters for PvP, although he could probably participate to some degree just by swapping to Poison Nova (or tricking someone to move over a zombie's rotting corpse? ). Thanks to maareek for the majority of the items (about time I did something useful with them, huh? ), as well as to CM for the tasty boots (and possibly a charm or two?). Thanks also to slowMG for always killing me with poison, motivating me to make a high damage greenie of my own. What program are you using to record your videos by the way? You used ONLY poison explosion all the way to the end of the game? That's crazy! 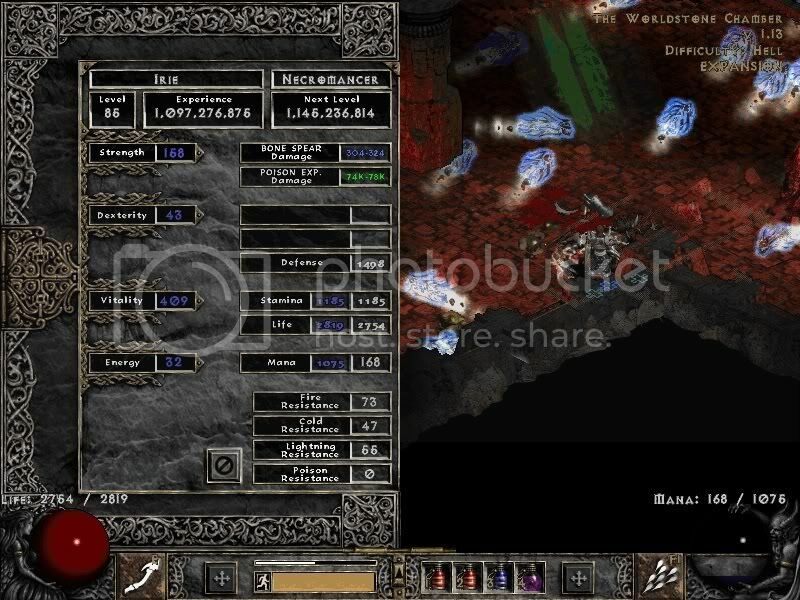 My own necromancer(nm act2) uses poison explosion alot, but combines it with nova and dagger. Did you try to get the merc to tank, make a corpse, and just make a poison explosion chain from there? Seriously, major congratulations on this! And I have to ask, what songs were those in the video? Suzunahara: Thanks! I'd wager that the majority of the members around here are much better at playing than I am though, and that you could easily pull that off given the chance. The first song is Thousand Enemies by Girls Dead Monster (Angel Beats! ), and the second is my favorite: Miageru Ano Sora de by Yuuki Aira (sola). You cured my desire to build a PE Necro! Even before that video, i had no desire whatsoever to make a PEmancer only. I bow to your dedication. I got a huge kick out of the part where Diablo bone prisoned the fire golem and then fire walled it. Brilliant! About time, indeed! ;p Sweet char, with a ton of stylepoints. Excellent job of creating a plan to maximize the effectiveness of the skill. I can imagine how this one played, even without the video, and I must say I'm impressed with your patience yet again. Enigma has to help, though. For the last ~2 weeks, forum downtime has occured for me around 1:30am - 2:30am, daily, without fail. For you, that'll be like 10:30pm - 11:30pm. You didn't notice? Poison Explosion only...*shudder*. I love how it took a minute to lure Diablo out of his pentragram pillow fort. Congrats. potter: I actually haven't watched Angel Beats!, or at least not much of it. :badteeth: Irie (of unknown given name?) from Higurashi. It was the only semi-fitting thing I could come up with.